I hope summer is treating everyone well. And as you enjoy those lazy days summer has to offer, why not take time to think about some of the fantastic places in Connecticut that you can spend your time. Then, why not enter our Essay Contest. 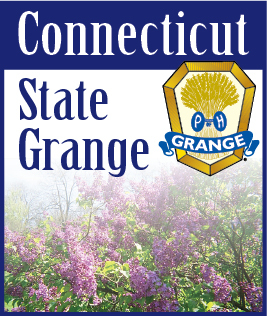 The title this year is “My Favorite Spot in Connecticut”. It should be 150 words or less. I can think of several spots to enjoy, learn and/or relax in our State. What is your favorite? There is still to write a letter to a solder. If you don’t have an address you can get them to me and I will see that they make their way to a soldier, sailor, marine or airmen fighting to keep our country free. Many Granges report sending packages on a regular basis. This is not a requirement but makes a great community service project. If you do send a box, please be sure and send a letter in it. Remember you do not have to be a Lecturer to do these projects.